Jeff and Sharon were pretty excited at the prospect of a quiet four day weekend—then the roofers asked if they could work. Tough decision, but it's still raining and our roof has been covered in plastic for a couple weeks now. We were ready for the roof to get put on. The correct color shingles were delivered on Friday morning. The roofers were out by Friday afternoon beginning the install, right up until the time it started pouring down bucketfulls—then they called it a day. Sharon was just as glad; it surely wasn't safe for them to be working in that weather. The weather today has proved to be much nicer. Mostly overcast with some occasional sun. This afternoon they finally shingled a portion we could actually see! We've got a green roof!! As a reminder, this is the exterior inspiration photo we finally settled on. 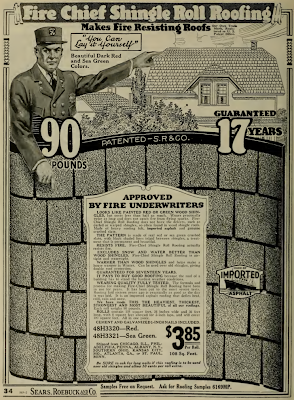 Of course, in 1912 the roof would surely have been cedar shingles. We're not going that route because we don't want to deal with the ongoing maintenance. We instead chose 50-year composite shingles recommended by Consumers Reports and hopefully won't have to do anything with the roof again while we live here. The roofers seem to be making good progress and may finish on Monday. Yes, they're working the holiday too! Sigh. We hope our neighbors don't get mad at us. 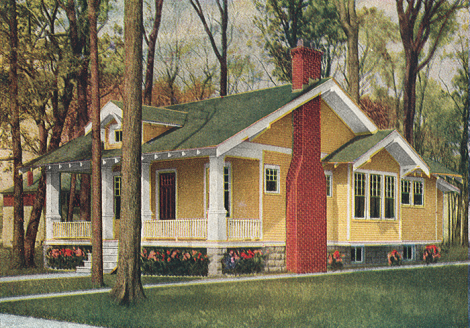 This last bit was added months later: Sharon discovered Sears was selling red and green-colored asphalt shingles in 1903. 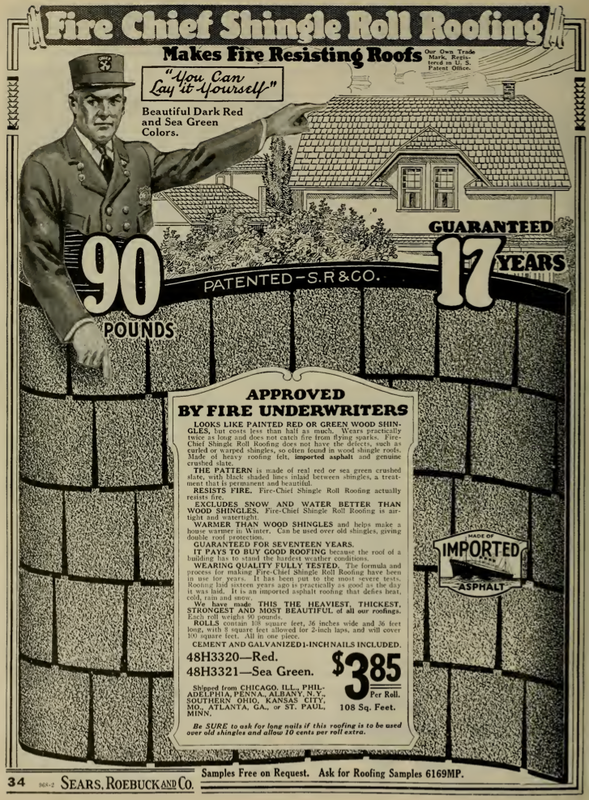 Here is an advertisement from their 1903 Modern Plumbing catalog. So, maybe our roof is a bit more period than we thought.